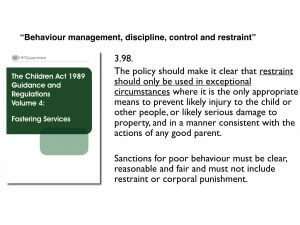 Understanding Legislation and Guidance for Foster Carer Restraint and Challenging Behaviour training. Our online learning system has been used by thousands of staff since its first use in 2014. Using video presentations by our Director of Training, Gerard O’Dea, coupled with knowledge-quiz activities, we quickly and efficiently enable your carers to be introduced to the key facts about the law, guidance and good-practice in the area of conflict communications and physical interventions for foster carers. Each carer is provided with a unique individual login to the system and can complete the work in their own time wherever they have access to the internet. Our in-person training, booked in for a time and place which is convenient for your carers, will cover numerous elements of both conflict communications and physical safety interventions which are relevant and appropriate for foster carers. We will work with you on the best ‘fit’ of physical tactics to teach your carers, depending on the level, frequency and impact of the behaviours they are dealing with. This in-person training is practice-focussed and includes scenario replication and role-play as appropriate to the carers’ needs. 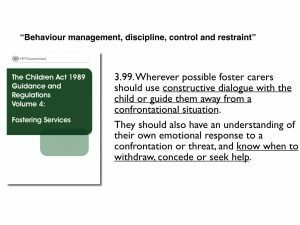 The online Foster Carers Restraint and Challenging Behaviour training is common to all foster carers as a baseline level of understanding needed to make good decisions about how to defuse and manage incidents of exceptionally high risk. The in-person training can be tailored to fit either a baseline of understanding about the management of conflict with looked-after children in general, or can be far more specific to the needs, triggers, cues and actions of specific children in your service who present challenging or distressed behaviours. Read our complete feedback comments and scores here. Fostering Agency Sued in £700,000 negligence case. 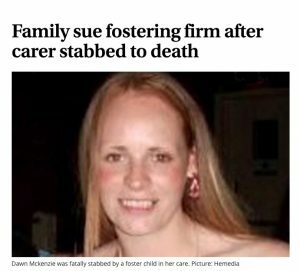 The death of a foster carer who was killed by a boy she was looking after was avoidable, an inquiry has found. Dawn McKenzie, 34, was stabbed by the 13-year-old at her home in Hamilton in 2011. He was later detained for seven years after admitting culpable homicide due to diminished responsibility. A fatal accident inquiry found that Mrs McKenzie’s death was not foreseeable. It may have been avoided, however, had her fostering agency taken proper account of her inexperience. The area of training of foster carers is clearly an important one. Whereas I am prepared to accept given the evidence which I heard, that [conflict communications and physical intervention training] is more effectively given after foster carers have commenced their caring … felt strongly that it ought to be offered to new carers at the outset of their fostering career because that was when they were at their most inexperienced or vulnerable. I find no fault with that argument. The action at Hamilton ­Sheriff Court had originally included a claim against ­Glasgow City ­Council, but that has now been dropped by the family. The family are seeking £500,000 for Mr McKenzie in compensation for Dawn’s death and £200,000 for her mother, Ray Byrne. Both claims seek damages for loss and injury as a result of alleged negligence. Mr McKenzie told a fatal ­accident inquiry into the ­killing that they had not been given enough ­information about the boy and had been let down by social workers. 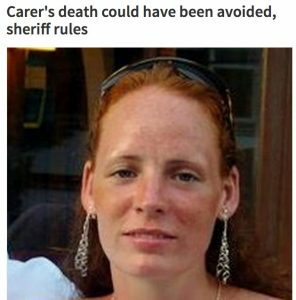 Sheriff David Bicket ruled that the carer’s death could not have been predicted, but might have been avoided had the firm taken proper account of her inexperience.